Also known as "bulky four"
A group with this eyeshape of a square of four is dead as it stands. 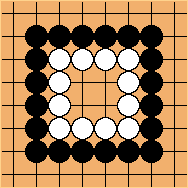 Even if White plays first, Black can kill her because the eye shape is bent three. 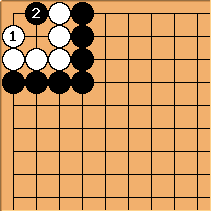 Nevertheless, the move (1) may be used as a KoThreat. The shape is dead, even if it is in the corner, for the same reasons. Alex: The only difference, when it's in the corner, is for purposes of capturing races. 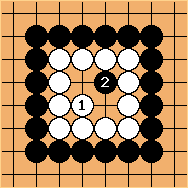 Square four in the corner only has three effective liberties, whereas square four anywhere else has five (need to almost fill with three, then the opponent captures, leaving three more liberties, the first of which is "free" because the opponent needed to take a move to capture: 3 + 2 = 5). ThorAvaTahr: In dutch this is often called 'Doodskist' or 'Grafkist' which translates to ('deathbox')'coffin', however I would like to propose the name of 'tombstone' for this shape. The name seems appropriate because the shape is as blunt as a rock and it is the paragon of death.